I recently got an invite from Axis Bank, courtesy Blogadda for a meet with the Geek team and the marketing guys of Axis Bank to chat over coffee for their newly launched "Ping Pay Karo", a mobile app. Ping Pay Karo is that mobile app which simplifies life of every mango people. Money transfer with lots of fun, nothing tedious and hassle free transactions. The day started on the same note. Yummy breakfast, chai, kofi and sandwiches. Nonetheless, Axis Bank corporate office is just so awesome. When we entered the conference hall, we were welcomed by the Geek team of Axis Bank who first gave us a brief introduction of their team and then started with Ping Pay Karo techno drama. 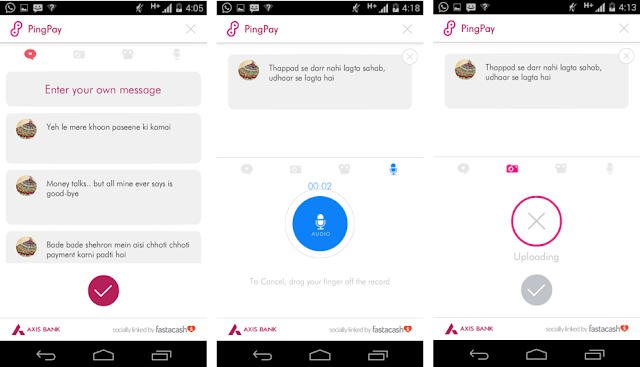 All the participants were curious to know that what is this #PingPayKaro exactly. I won't, keep you, in suspense anymore, here is Ping Pay Karo for you. A multi social payment app by Axis Bank, a first of its kind app in India. 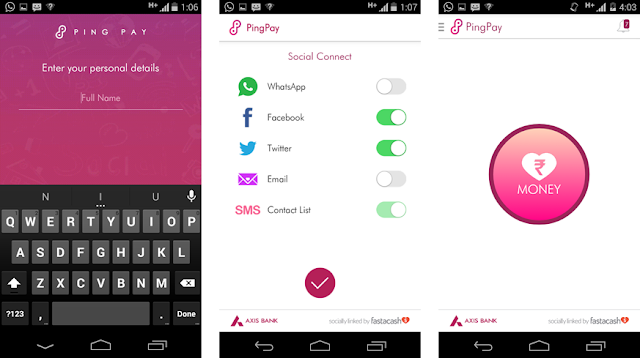 Just ping, ask for and send money to any one on your friend list from Whatsapp, Facebook, Twitter, email or Phone book. Its the only banking social payment application, allowing users to share digital content like text, audio, video and images while making any transaction. Ping pay is developed in partnership with Fastcash, a Singapore based, venture capital backed firm. The technology used by Fastcash enables value (money, airtime, coupons etc) transfers, along with digital content, across any social network and messaging platform. It is an innovative gesture based mobile app designed to provide customers with a unique and interesting experience while making any kind of transaction and mobile recharge is made easy! Every time you send or ask for it, have your own quirky message ready and send it. From customized messages to pictures or videos, make transaction beguiling. Connect people digitally. Your social skills put to great use. Next time your parents ask you what you do on social networking sites the whole day? Guess you have a better answer this time. You get a rich user banking experience and not only Axis bank customers but its an entry point for non - Axis customers too. Its special features make it more appealing viz. 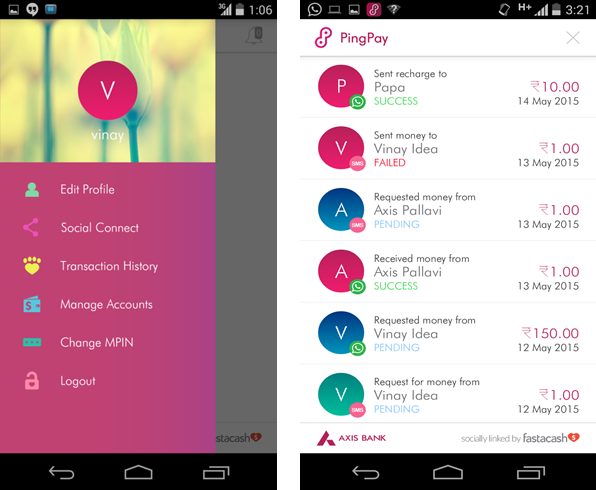 (Send money, Ask money, Send recharge, Ask recharge) x Socially; Open a Savings accounts with Axis; View account balance etc. [Once app is downloaded it becomes that mobile / sim specific and once you change the no. or handset, the setting needs to be done again. Transaction limit - Rs.50 K / day / transaction. Register your number by entering it in and accepting the T & C. Fill in your details and you are good to go. For sending money, the user chooses a social or messaging channel and selects the name of the person to whom the money is to be sent. Enter the amount to be sent and set a “ping code” that is shared separately with the receiver. 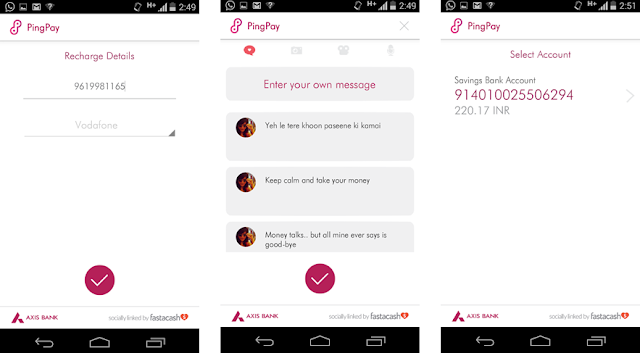 On confirming the transaction, the money is immediately sent and the receiver gets a message across the social or messaging channel selected by the sender, you can opt for any kinda message from the list or just have your creativity working. The receiver has 15 days to transfer the money to his/her bank account using IMPS. In the event, the receiver does not claim the money received within 15 days, the transaction would be auto-reversed to the sender’s account. 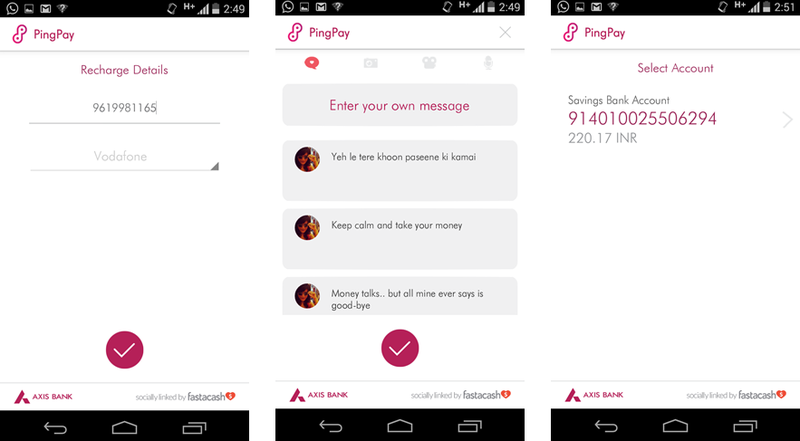 Ping Pay also has ‘Ask for Money’ and ‘Ask for Recharge’ options, which would allow the receiver to put in a request for funds and also seek recharge from their friends and family across social. Don't forget to use those lovely or quirky messages. After all lending money can be a l'il disheartening so why not make sender smile or laugh with your innocent yet giggly messages. Recharge works the same way as any transaction, receiving or sending money. 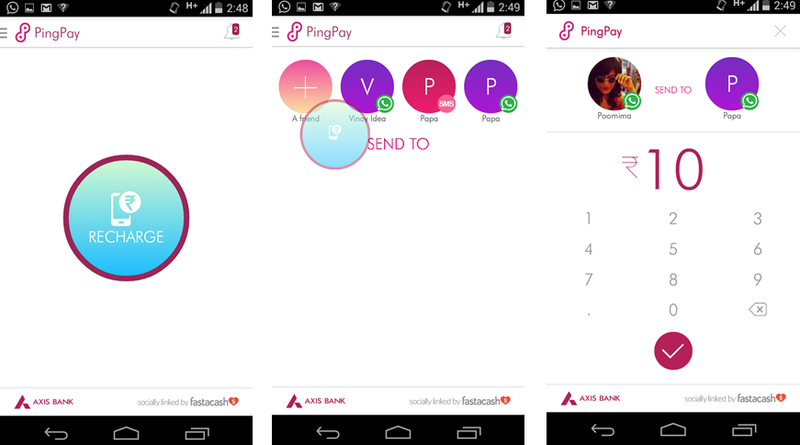 Sender need to have an axis account while the same is not necessary for a receiver of money. But there is definitely an option for non Axis users to open an account and well, who won't be tempted!? Yes you can check it too. Just go to home / setting and click on Transaction History. It will give you a list of successful, failed or pending transactions with the amounts in question. Can't wait to download the app and start using it. I am already an Axis customer so sending money or recharging cell won't be an issue when I am on the move. 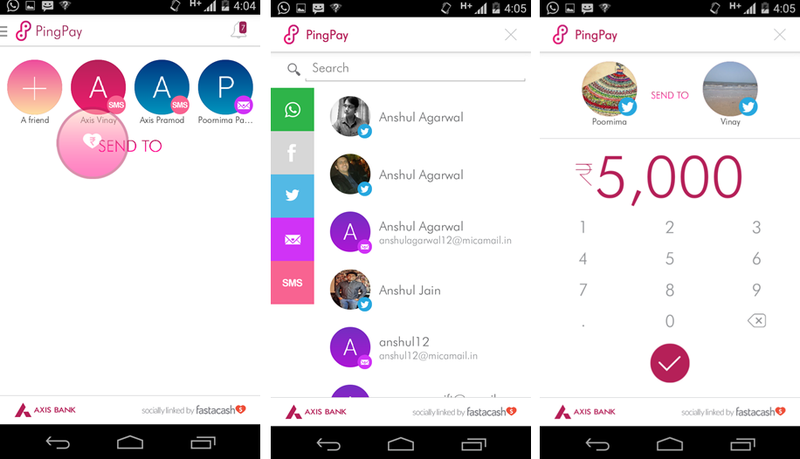 Being a traveler who is truly active on social media and a smart phone user, Ping Pay is a boon. Its an awesome creation by Axis - Fastcash union. Kudos! Axis, you have outsmarted yourself yet again. 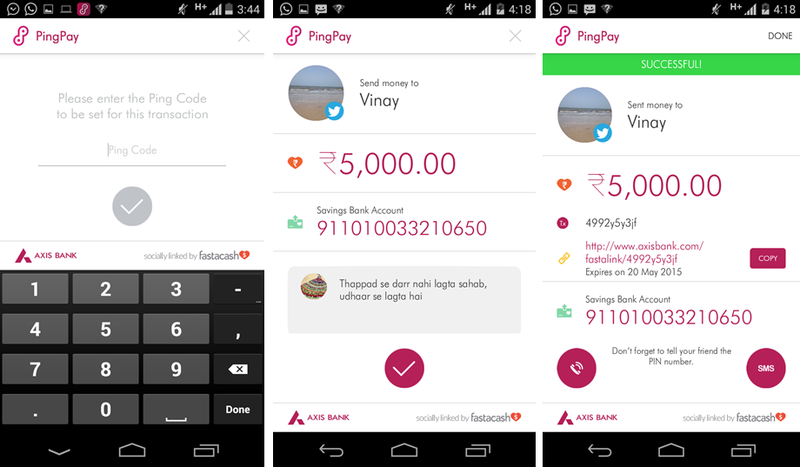 Don't delay, just download Ping Pay app right away and start with #PingPayKaro. P.S. - This post is about 'Digital Axis' meet conducted by Axis Bank in association with BlogAdda.com.